Crowded #1 review: A picture-perfect analogy to the real world – AiPT! Nowadays science fiction stories are not a question of “if” it can be done, but of how soon. Today’s world is so technologically advanced it can feel almost impossible to write a fanciful science fiction story. The people who watched the original Star Trek series were in awe at the idea of communicating with something you can wear on your wrist. In 2018, every science fiction story is not a question of “if” it can be done, but of how soon will it happen. As exciting as that may be for some, that fact is also what makes Crowded from Image Comics so scary. In the very near future, any service you need can be easily found on your smartphone. This is shown very early in the book in a series of panels narrated by one of the story’s main characters, Charlotte Ellison. From walking dogs to providing companionship to lonely old men, her day is spent doing various odd jobs she learns about on the internet. An app was also what led her to her new employee, Vita. Christopher Sebela’s writing does an excellent job of world building. Some of the things are in the reader’s face, such as food dispensing machines and tabletops that double as computers. Other things are more subtle, like Charlotte being shocked at the fact Vita only has one job. Everything that Sebela includes in his futuristic story is also based in reality, making Crowded more relatable. Sebela’s writing provides some insight into Crowded’s two main characters while setting up its premise. The comic is set ten minutes in the future when it is possible to crowdfund assassinations through Reapr. Charlotte is mysteriously the multimillion dollar target of one such campaign and has found Vita through Dfnd. Aside from the fact that Vita is the lowest rated bodyguard on the app, we learn little else about her. This is where the story slightly falters. It becomes apparent that there’s more to both characters than either is letting on. Charlotte is not as sweet and innocent as she would have her bodyguard believe, while Vita is not as uncaring as she would like her new charge to think. There are some neat bits that give some background into both (there is a great scene in which Vita talks about how unimportant her past is to her), but other than that, the two lack much depth. Art is very important in a story like Crowded. The book is filled with action and if Ro Stein’s art does not keep up with Sebela’s writing, then the whole thing is a failure. Thankfully, Stein’s art captures the tone of the book perfectly as the book takes on a movie-like look that heightens the excitement of each scene. Stein uses lots of panels and some great splash pages to maximum effect. Ted Brandt is the inker on Crowded and works perfectly with Stein to enhance the murder-for-hire tale. The greatest accomplishment of the two’s work is the emotion they managed to get across. In the comic’s opening, Charlotte is constantly on her phone and Stein does a great job of showing how oblivious she is to the world. The world around her is brightly colored, but it’s clear she doesn’t notice it. Later in the day when she’s off her phone, shadows are used as if to show how unimpressed Charlotte is by the real world. The crowning achievement is towards the end of the issue as Charlotte slowly walks around Vita’s darkened house. The perfect shadowing accentuates the look on the crowdfunded target’s face. Crowded is an action-packed book whose setting is more than a little frightening. The reliance on technology is a picture perfect analogy to the real world. 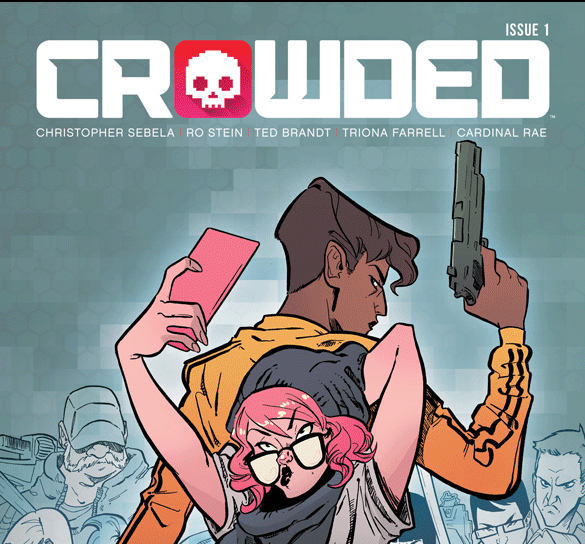 Along with the great social commentary, Crowded is an action packed and fun story.